One of the key influences that led to creation of the first Scrum was a paper on the Japanese way of new product development by Tacheuchi and Nonaka . 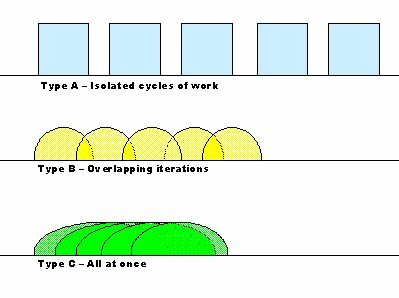 This paper had a chart showing product development separated into silo’s (Type A), phases slightly overlapped (Type B), and all phases of development overlapping (Type C). Type A, the Japanese viewed as an outmoded relay race type of process. Type C they envisioned as Scrum where all phases of product development were overlapping. One can reinterpret this diagram at a higher level and think of it as applying to different types of Scrum execution. A Type A Scrum does all work on a Sprint within the timebox of the Sprint, which results in downtime when reorganizing for the next Sprint. By adding product definition tasks for the next Sprint into the current Sprint, a Type B Sprint allows work to flow smoothly from Sprint to Sprint. A Type C Sprint, often called Continuous Sprint, runs multiple overlapping Sprints through the same Scrum teams.